For our honeymoon, we chose Iceland. We wanted a place that was different, that we’d never visited before, and that was relatively close. We also aren’t big beach goers so a place that was cool and cloudy was fine with us. 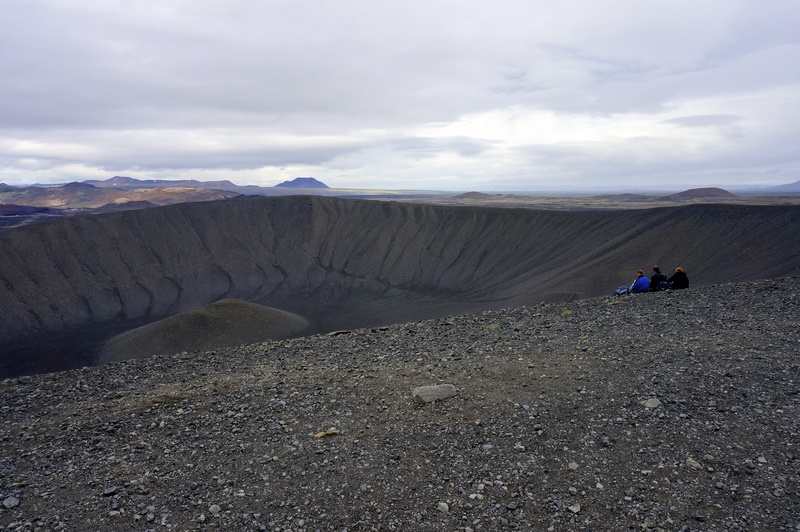 In the end, Iceland proved to be not just a great honeymoon destination but one of the best vacations we’ve ever taken. We rented a 4×4 to drive around the country and we ended up putting over 1,000 miles on it. And yet, we were never bored while driving. Not for a second. On every corner and every off-road there was something spectacular to see. 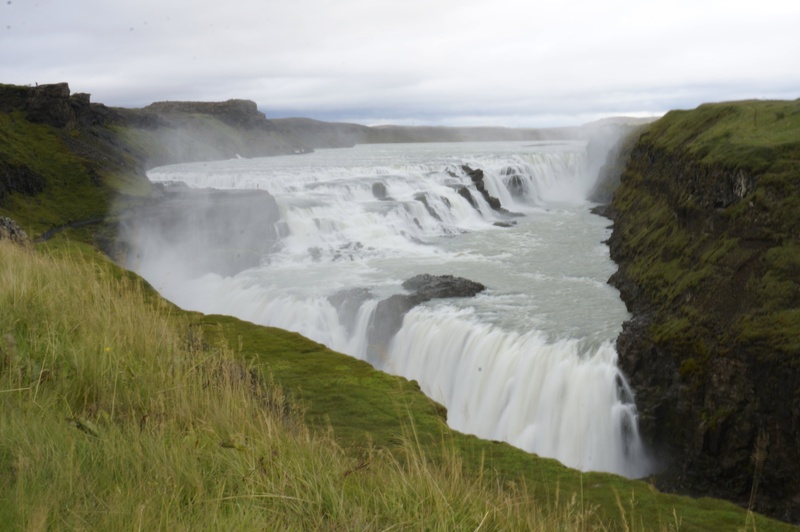 Iceland has a lot of water. There are waterfalls everywhere. 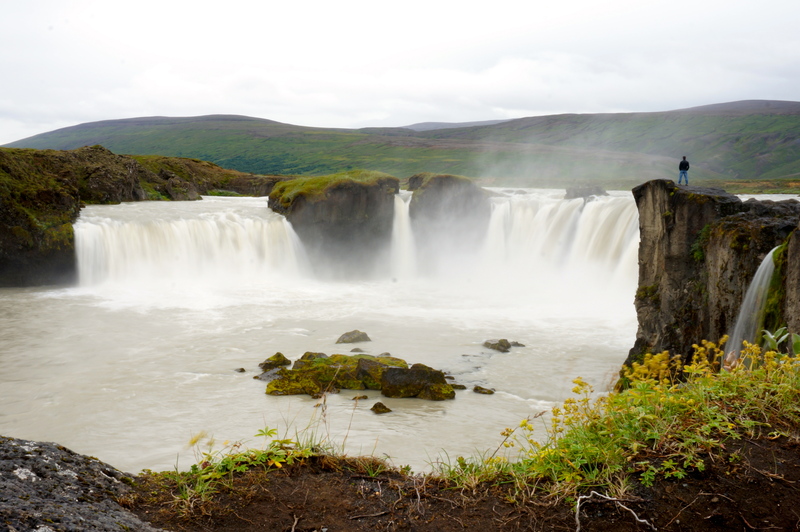 Some are huge and majestic, like Gulfoss and Godafoss that we visited. But many others are just small waterfalls sprinkled around the countryside. We must have driven by dozens of them. 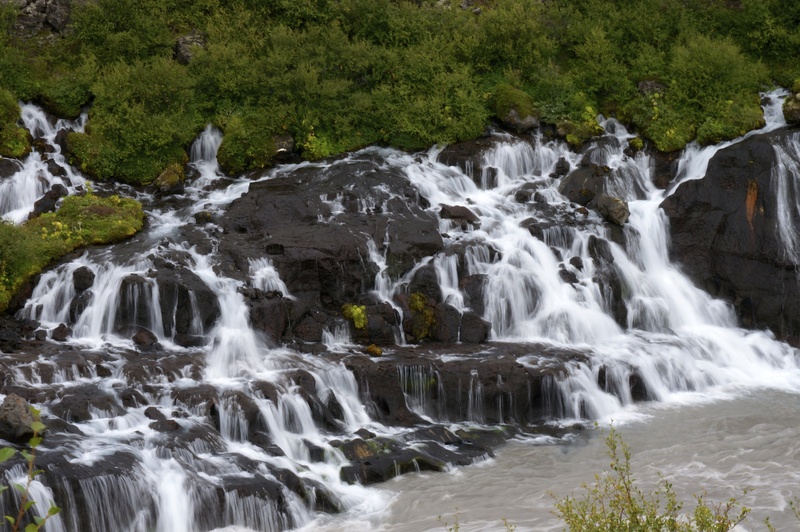 Water is also important because there is a lot of geothermal activity in Iceland. 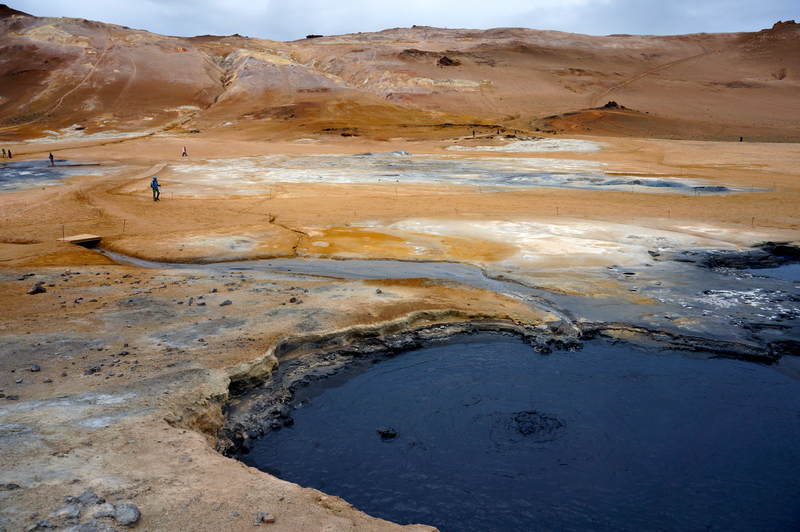 Most energy produced in the country is 100% clean and uses steam from geothermal sources. And of course, there are thermal baths everywhere. 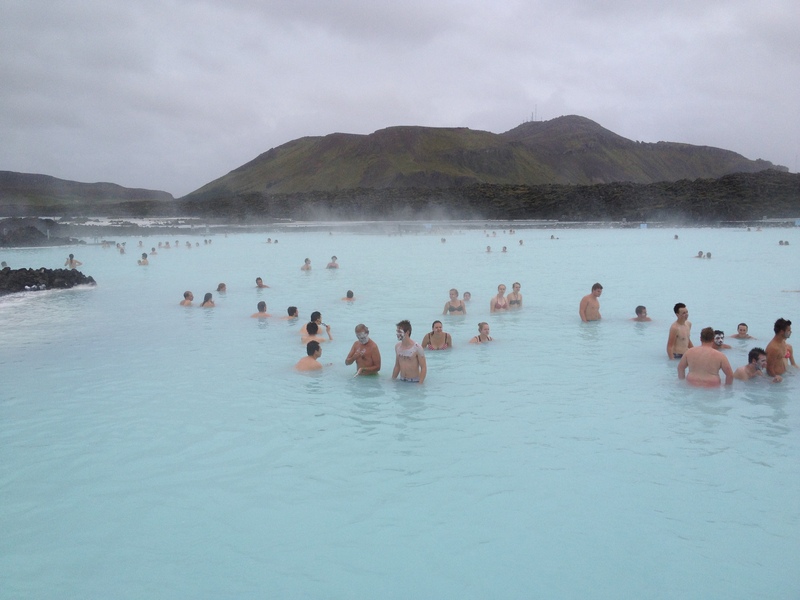 We visited the Blue Lagoon, the famous one outside Reykjavik, which was impressive, though a little touristy. 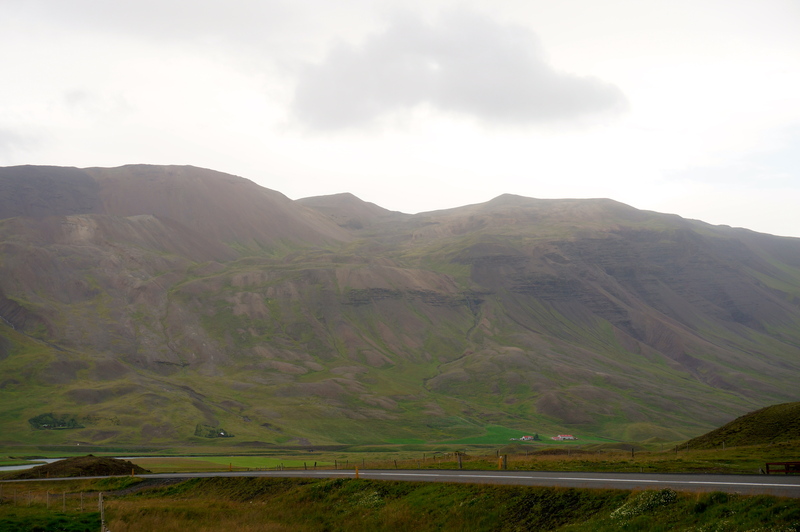 The other thing you notice in Iceland are the mountains. 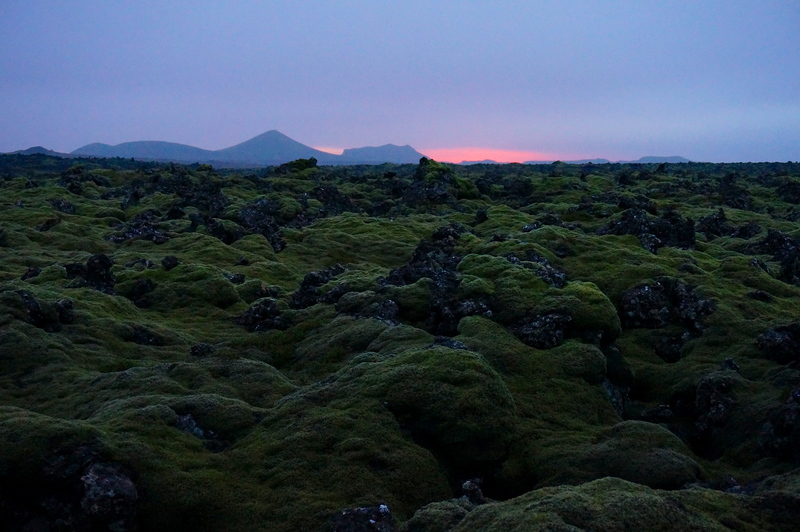 They are also everywhere, some covered by glaciers, and they resemble giant boulders thrown from the sky. Many of them have flat tops. That’s because almost all of them are volcanic. They whole island of Iceland is actually in flux. It sits right where the North American and Eurasian tectonic plates meet, so there is constant activity. 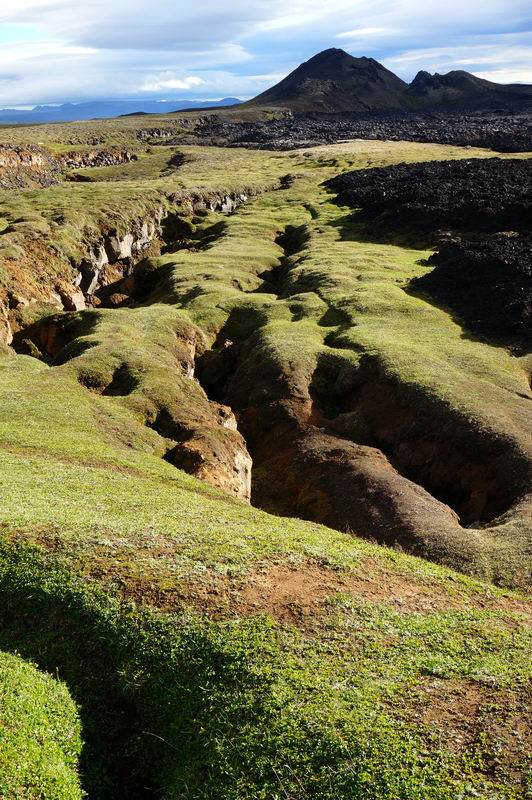 Volcanoes and earthquakes are part of the country’s character. And along with the imposing mountains come the skies. 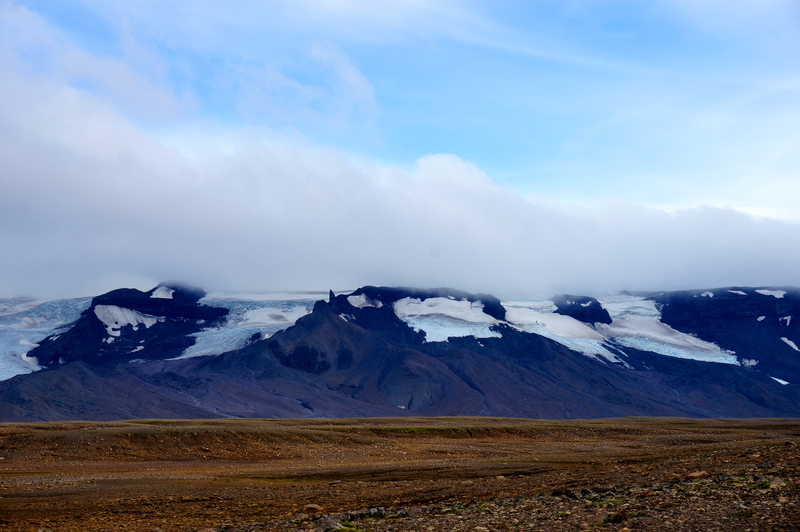 The climate in Iceland is more temperate than most people think, but it is also constantly changing. Clouds and rain came and went at amazing speeds. 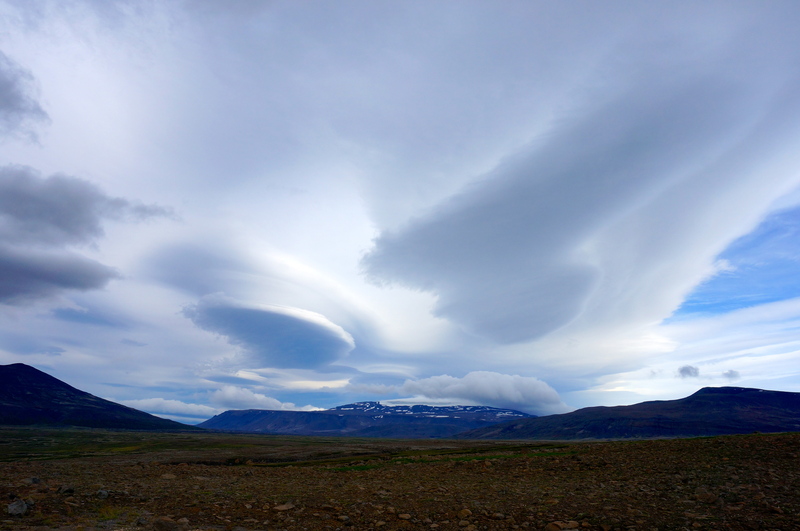 We saw cloud formations we had never seen before. And rainbows. Lots of rainbows. 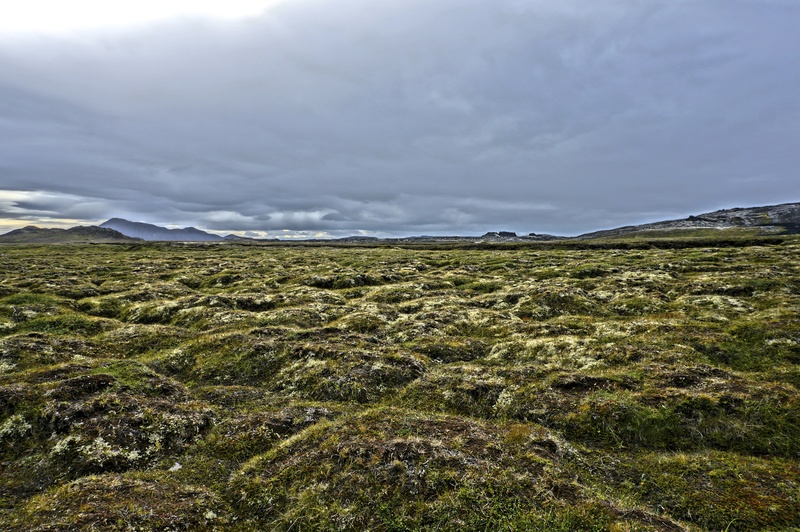 No photograph can do justice to the Icelandic landscape. 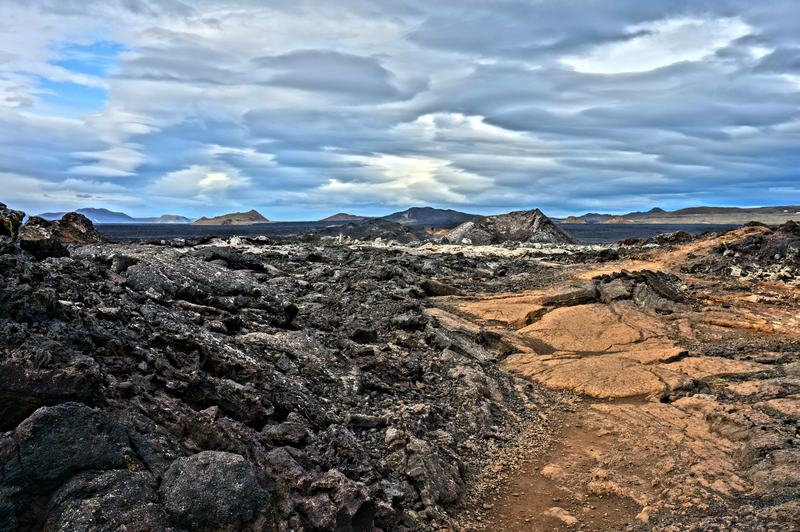 We walked among lava fields that were barely 30 years old. We could see just where the charcoal black lava ended its destructive run and cooled. We toured bubbling mud pits, where the water literally boils in big holes in the ground. The earth there takes on shades of orange and terracotta, creating an otherworldly view, made even stranger by the strong sulphuric smells. But enough about the landscape. You’re here for the food, right? 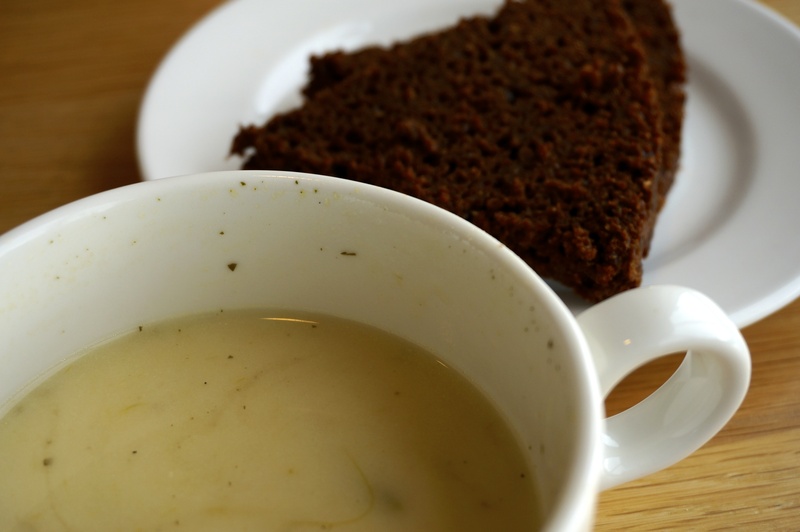 Icelandic cuisine, or at least what we experienced, is representative of the harsh conditions of the island. There’s little local produce (though we heard there’s an area filled with greenhouses) and the most prominent meat is lamb. In fact, we saw sheep everywhere, grazing freely in the vast uninhabited countryside. We wondered often if anyone even owned them, but upon close inspection, we saw they were tagged. 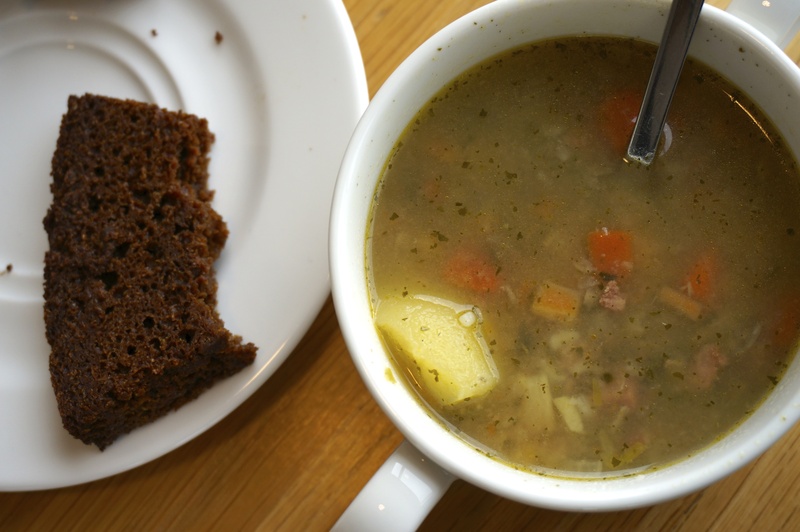 If there’s one thing that is distinctly Icelandic, it’s soup. 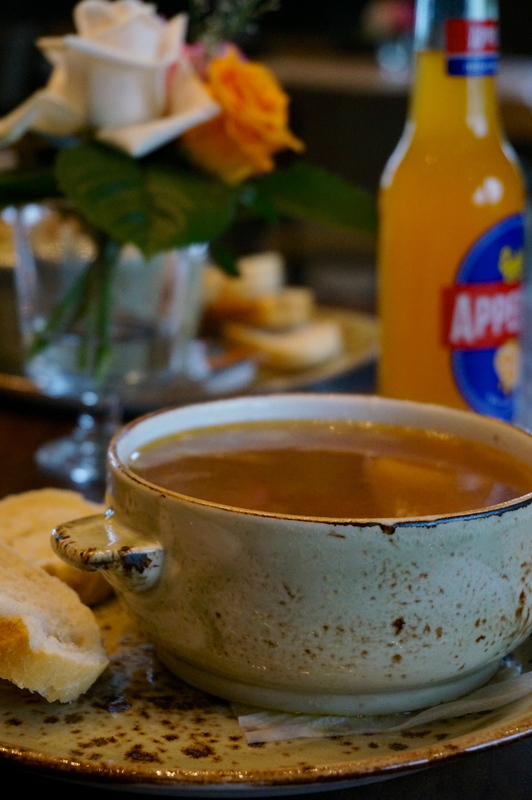 Soup and bread was an option at every establishment we visited, from restaurants to rest stops to gas station eateries. Pretty much everywhere, the soup was excellent. Even in places you wouldn’t expect it, like souvenir shops in remote areas. We especially loved the lamb soup and asparagus soup we had at the tiny place at the entrance of a volcanic column park we visited. It came with a dark, sweet bread, that was a cross between rye bread and pain d’épices. 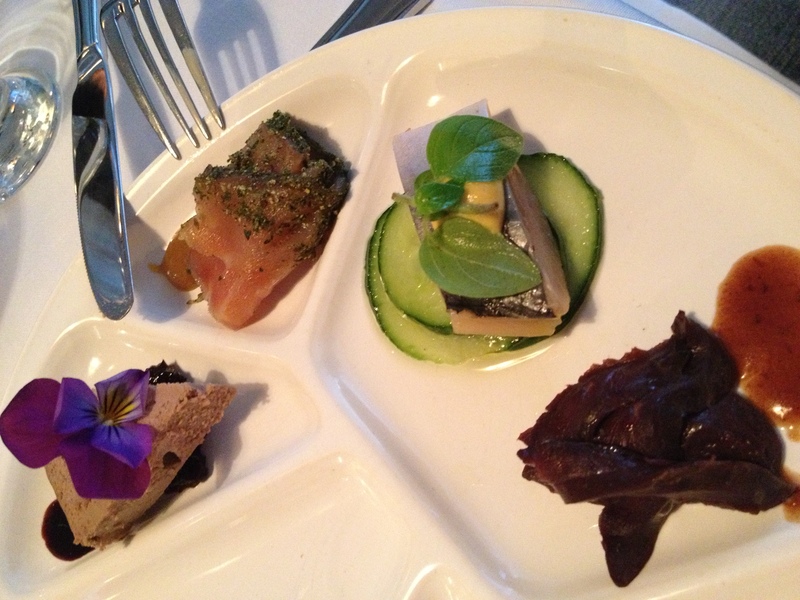 On our first night, we had dinner at a really nice restaurant in Reykjavik called Fridrik V. We got the 5-course tasting menu, which was too much food, but featured ingredients from different regions of Iceland. The staff, all members of one family, proudly explained where everything came from by pointing at a map of Iceland. We got to try puffin (though we never saw any live ones…hmmmm) and reindeer. 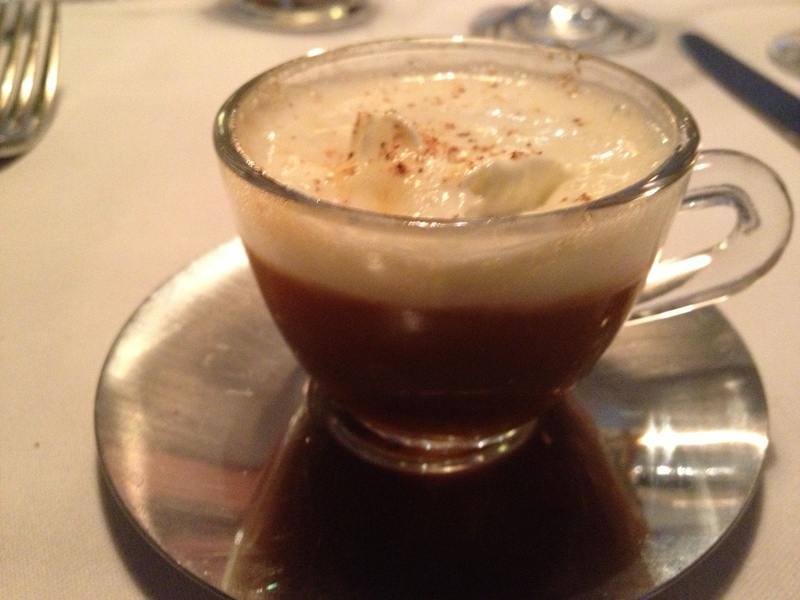 They also served us something they called lobster bisque cappuccino, which was one of the best things we’ve ever tasted. At a tiny port town called Stykkisholmur, we got even more adventurous. 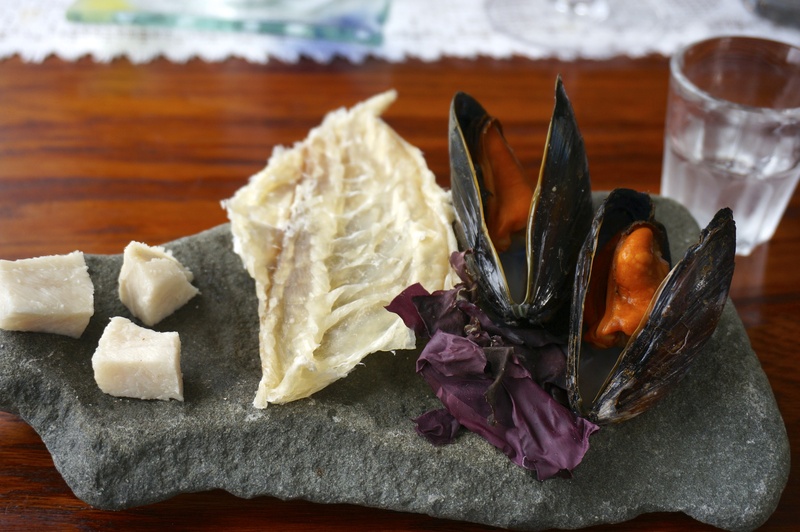 We had an appetizer that featured shark, dried fish, kelp, and mussels. The shark had such a strong fermented taste, we compared it to formaldehyde. We asked the waiter about it and he explained that it had been buried in the ground and allowed to ferment. For my main dish, I chose whale. I was surprised to find that whale meet is red and has the texture of beef. In fact, if I hadn’t known it was whale I would have thought it was a regular steak. 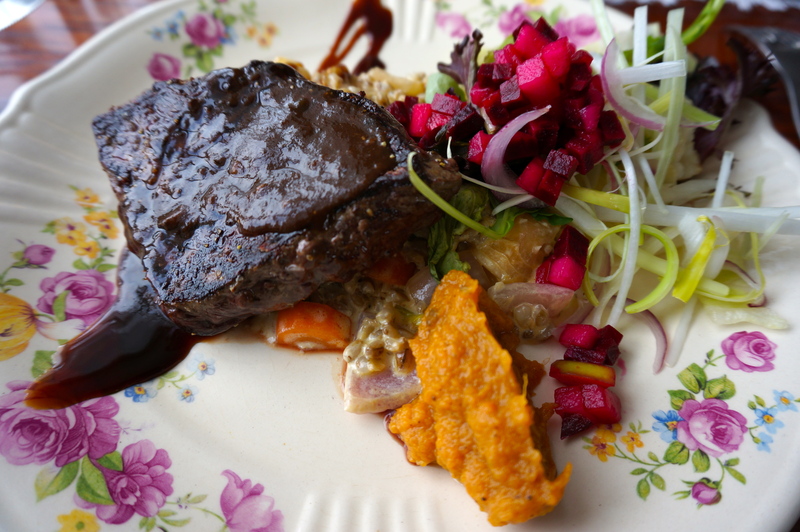 Overall, the food in Iceland was really good everywhere. We had one bad meal and that was at a Thai takeout place that we went to because everything else was booked and we were very hungry. Oh, and one more thing. 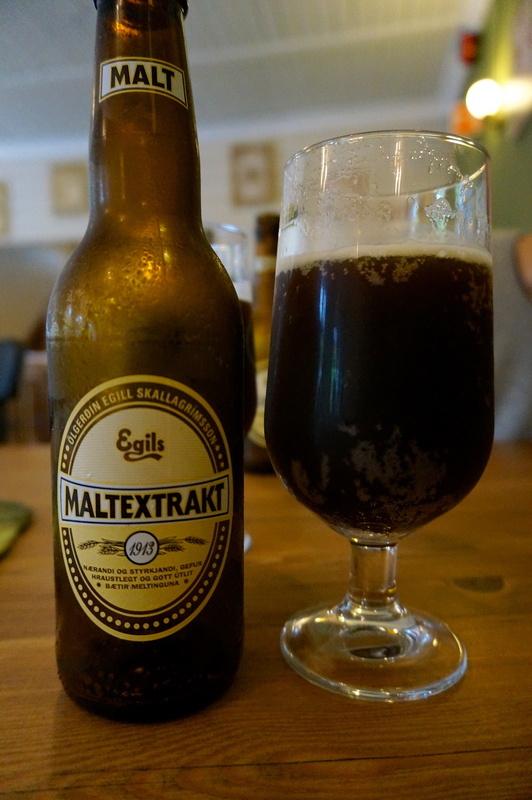 We discovered Maltextrakt, a delicious soft drink made with malt. It’s non-alcoholic and sweet, with the distinctive toasted taste of malt. We ordered it a lot, when we didn’t want alcohol with our meal. This is Anna Maria. 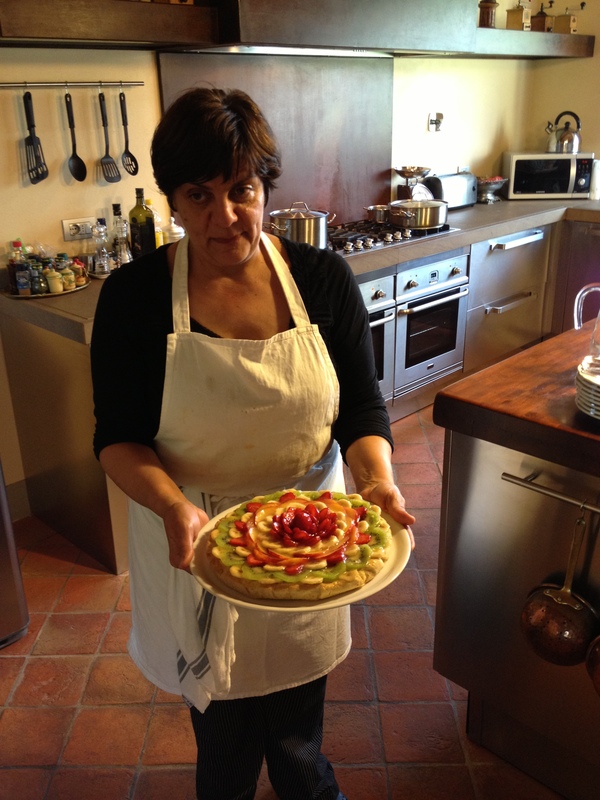 She was the chef that cooked for us twice while we were staying at the Podere Scopicciolo in Tuscany this past week. The first meal was on the night we arrived. It was a great dinner, which included probably the best lasagna I’ve ever had, and it really wasn’t matched by anything we ate until four nights later when we hired to cook for us again. 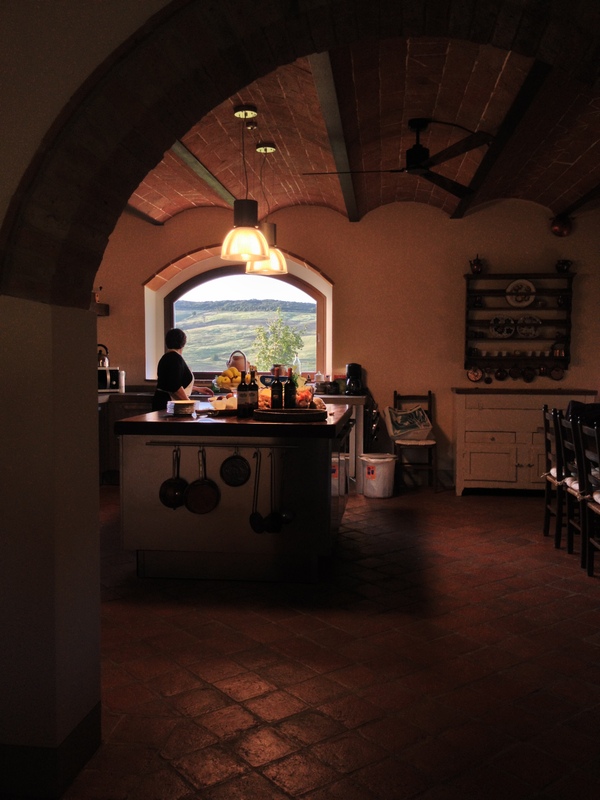 We arrived to the Podere after a long day of sight seeing and found her in the beautiful kitchen putting the finishing touches on our dinner. We quickly sat down, like little children coming in from playing outside all day, hungry for their mom’s home cooked meal. 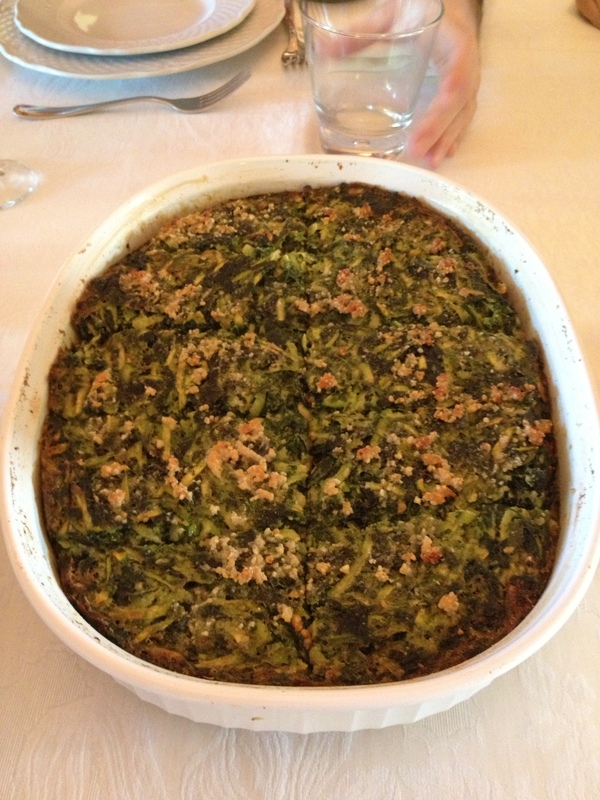 She started us off with a baked casserole of shredded zucchini and spinach with a crunchy topping. It was probably the best thing we ate in Tuscany all week. I can’t even begin to describe the richness of flavor and the contrast of textures, between the crunchy top, the soft interior, and the crusty bottom. We licked that casserole dish clean. Even Anna Maria was impressed. 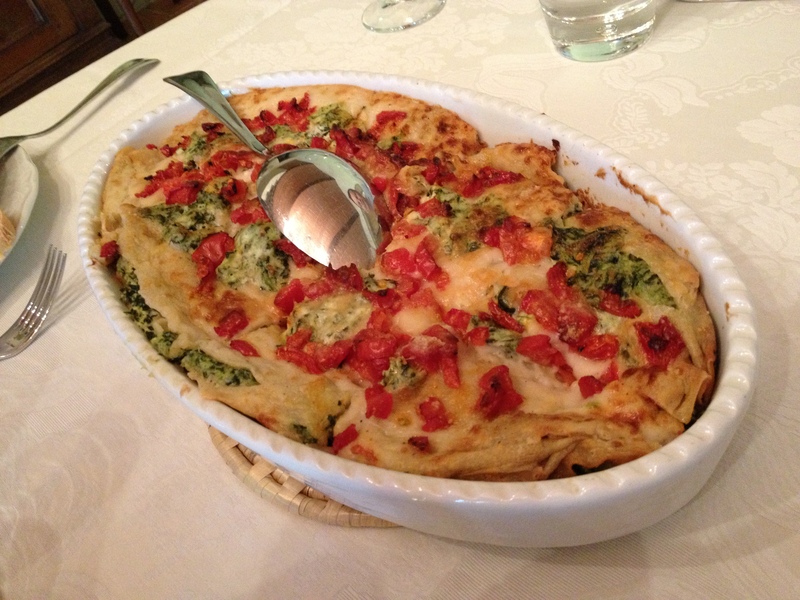 The next dish, the primi, was another baked dish. This time it was crespelle, small crepes that were stuffed with ricotta and spinach and cooked with tomatoes. It was another comforting dish that easily let each ingredient shine. Our next course, the secondi, was a traditional beef stew called peposo. 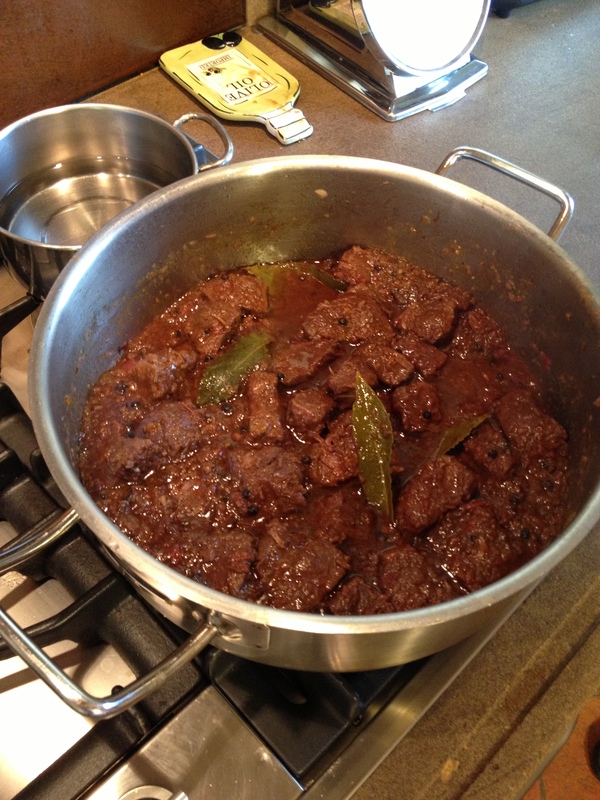 Tender chunks of beef were cooked in a wine sauce, flavored simply with whole black peppercorns and bay leaves. Once again, it was a simple dish that was full of concentrated flavors, perfect with the Chianti wine we drank. 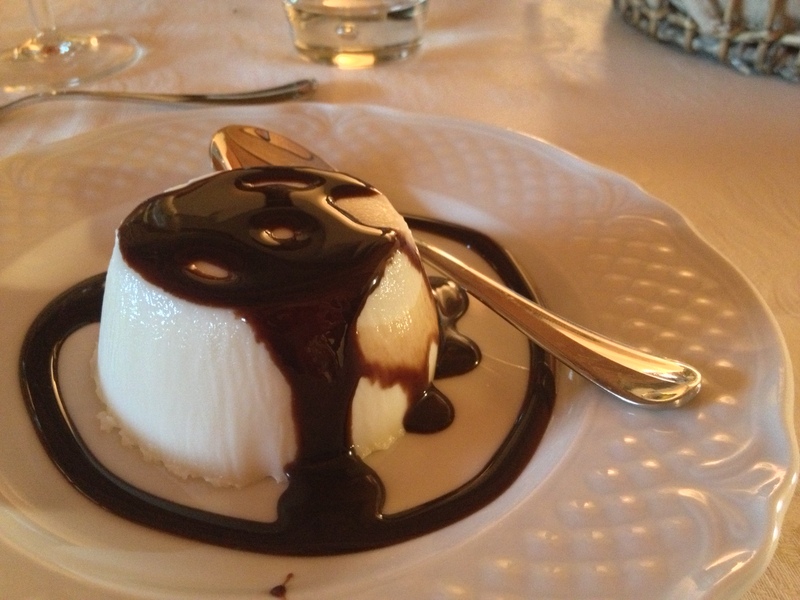 And for the finale, she made a panna cotta with chocolate sauce, something I noticed was available in many Tuscan restaurants. 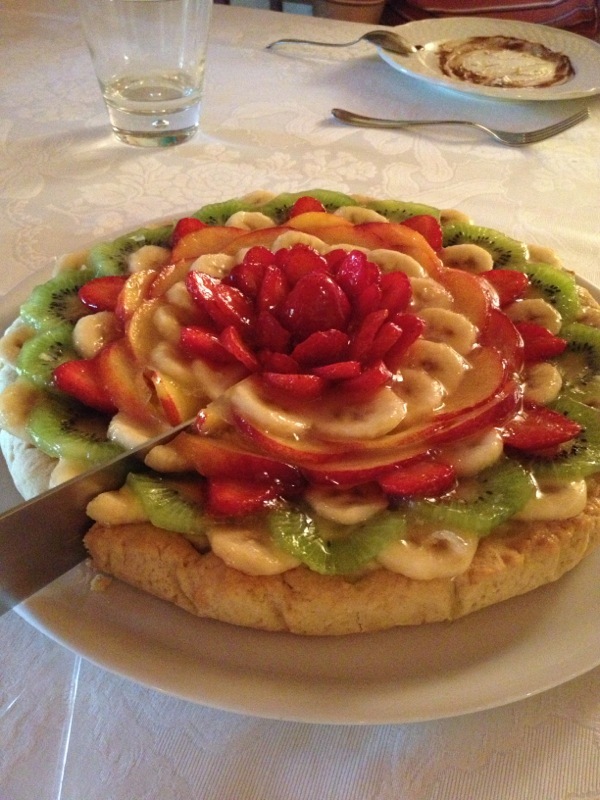 She also prepared a fruit tart for us but by then we were so full, we barely touched it. On our last night, someone in our group asked everyone to name their favorite dishes from the week in Tuscany. 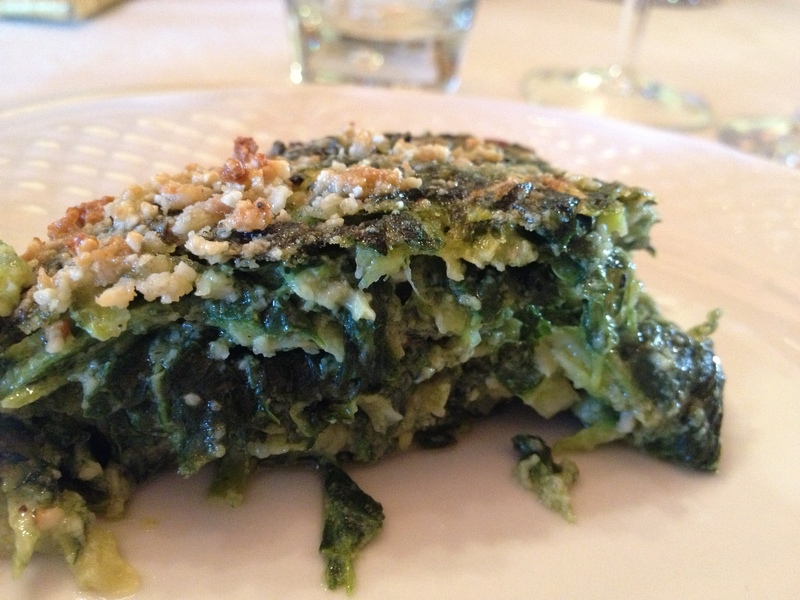 Anna Maria’s lasagna and zucchini/spinach casserole were unanimously placed at the top of the list.